NEW! Retro Floral Website Template Header great for any salon or spa business and many more. 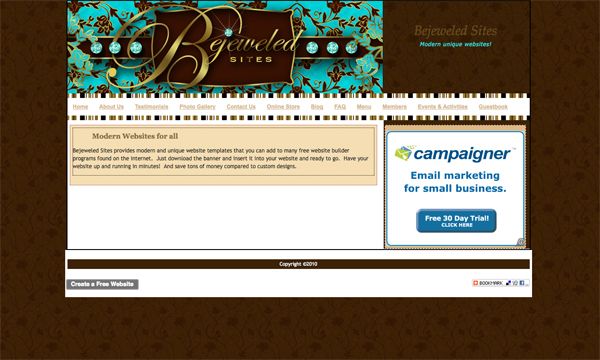 Just add your company name and insert into your WordPress Web Blogsite, newsletter or any other website. Make a great first impression! Copyright text will not appear on downloaded image. 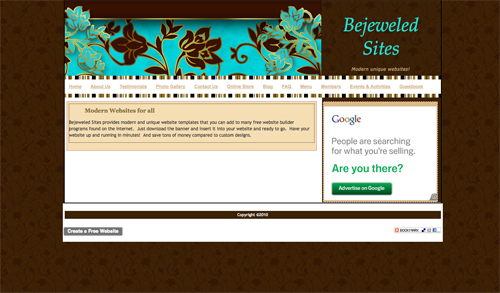 Here’s the gold floral blue banner as a website template accent when you don’t have any way of adding your company name, then you can type it in the space to the side as shown here. This one was added to webs.com, a FREE website building program you can access online. This banner is 760 w x 210 h (pixels) supplied in jpeg format. DOWNLOAD NOW for only $59.99! Here’s a slightly different version of the gold blue and chocolate brown website template especially made for a WordPress blog at 760 w x 190 h (pixels). Supplied in jpeg format. Just add your company name. DOWNLOAD NOW for the bargain price of $59.99. Here’s an example of a website image that was applied to a FREE website builder program, , to make your very own site with a customized touch in just minutes. See the matching Gold Blue Floral Business Card, just click the link above, only $24.95 for printing!! Download this pretty web design template header, only $59.99. Actual size 1000 w x 450 h (pixels).